There is a lot of information out there that talks about fluoride; some is positive, some isn’t and some is downright confusing! Busy parents need to know what’s best for their kids, so I’ve taken the time to provide some information below so you can know all the facts about fluoride and your child’s dental health. This is a simple fact! Fluoride, which exists naturally in water sources, is derived from fluorine, a common element in the Earth’s crust. It is well-known that fluoride helps prevent and even reverse the early stages of tooth decay. How exactly does fluoride help combat tooth decay?It protects teeth when it comes in contact with the surface of the teeth and it kills the bacteria that causes cavities. In other words, your child’s teeth benefit from fluoridated water as well as fluoride toothpaste. The short answer is “yes” but let’s look at it a bit more closely. For over 60 years, water fluoridation has proved to be a safe and cost-effective way to reduce cavities. As a matter of fact, fluoridation is estimated to reduce tooth decay by 20 to 40 percent in children. That’s significant! The benefits of fluoridated water can’t be ignored. Treating cavities is important, but preventing cavities is best. That’s where fluoride comes in. Millions of children in the United States and around the world have been spared thanks to fluoride in tap water, toothpaste and routine dental checkups. Drinking water with fluoride is important for children’s teeth. The key is that the research shows that the fluoride is most effective when it is a minimal amount in multiple exposures. That is why we love fluoridated water so much! Why do some people think fluoridated water is a bad idea? Fluoride, like most things that are good for you, can be less healthy in excess. Too much fluoride can cause dental fluorosis. 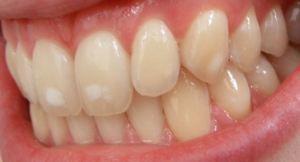 Dental fluorosis is a change in the appearance of the tooth’s enamel. These changes can vary from barely noticeable white spots in mild forms to staining and pitting in the more severe forms. Dental fluorosis only occurs when younger children consume too much fluoride, from any source, over long periods when teeth are developing under the gums. In the U.S, water and processed beverages can provide most a child’s fluoride intake. Unintentional swallowing of toothpaste and inappropriate use of other dental products containing fluoride can result in greater intake than desired. Under the age of 6, it is recommended using an amount of fluoride toothpaste that is equal to the size of a grain of rice. Parents should supervise the use of fluoride toothpaste by children under the age of 6 to encourage them to spit out excess toothpaste and avoid swallowing fluoride mouth rinses. A U.S. Public Health Service review of data and research concluded that there is no credible evidence of an association between either natural fluoride or adjusted fluoride in drinking water and human cancer. It has not been shown to cause or worsen conditions of the thyroid, kidney, heart, or other glands/organs. The only proven risk associated with excess fluoride is a cosmetic condition known as dental fluorosis. What if fluoridated water isn’t an issue because your child drinks bottled water? Bottled water is one of the more popular drinks in Arizona, but, may not contain any fluoride. Per the American Dental Association, most bottled waters on the market do not contain optimal levels of fluoride. Many dental health specialists suspect bottled water’s increased popularity as the culprit behind rising rates of cavities. Because fluoride helps strengthen teeth, it is a vital component of maintaining good dental health. If your child won’t drink tap water, or if you won’t let your child drink tap water, you can always try a Brita filter. The Brita filter will filter most everything out of the water except for fluoride. Be sure to check the label to make sure that your bottled water contains fluoride. Understanding fluoride and your child’s dental health will lead to healthy smiles for a lifetime! Fluoride is one of several factors that will keep your child’s teeth healthy. It’s still important to brush and floss daily, avoid sugary sweets, as well as limit the frequency of carbohydrate intake, in addition to maintaining your child’s fluoride intake. Still have questions about fluoride? Contact your pediatric dentist and have them explain your options to ensure your child is getting enough fluoride.